The sculptures, drawings, installations and videos by this French wife-husband duo, Lucy+Jorge Orta, collectively explore major concerns that define the 21st century: biodiversity, environmental conditions, climate change and exchange among cultures. The sculptures, drawings, installations and videos by this French wife-husband duo, Lucy+Jorge Orta, collectively explore major concerns that define the 21st century: biodiversity, environmental conditions, climate change and exchange among cultures. These models and machines constructed by the Ortas, suggest ways to purify, prepare and transport food and water, or launch a world-wide humanitarian effort. These humorous, jerrybuilt contraptions are poetic metaphors for these processes, and demonstrate the importance of art as a creative agent for awareness and change. This show is the first major traveling exhibition in the U.S. of the Ortas' work, and Ben Maltz Gallery its only West Coast venue. 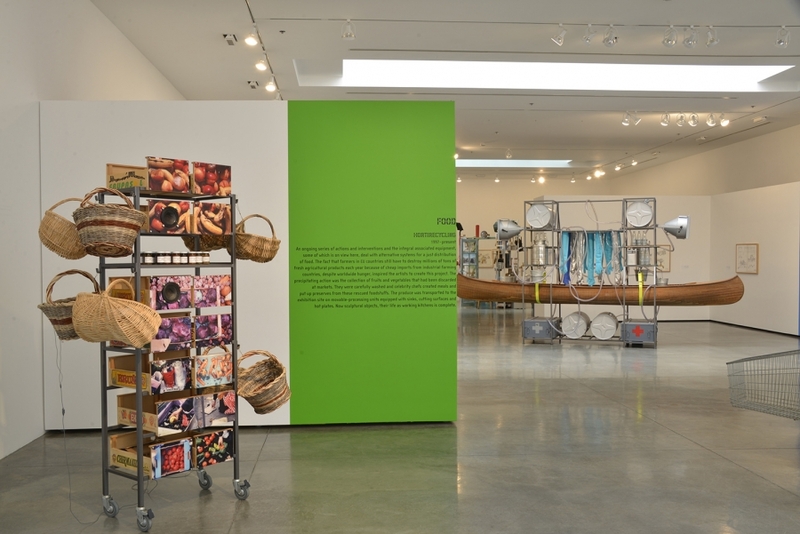 Food - Water - Life / Lucy + Jorge Orta is organized by Tufts University Art Gallery, Medford, MA, and it is curated by Ginger Gregg Duggan and Judith Hoos Fox (c2 | curatorsquared). The exhibition at Ben Maltz Gallery was funded in part by the OTIS Board of Governors. Organized by the Tufts University Art Gallery, Medford, MA; curated by Ginger Gregg Duggan and Judith Hoos Fox (c2|curatorsquared). Ben Maltz Gallery is the only West Coast venue of this U.S. premiere of the Orta’s work. Lucy + Jorge Orta are on campus October 20-25 for a week-long residency working with Otis students and giving lectures. The residency week culminates with a public conversation between the artists and the curators, followed by a reception, on Saturday, October 25, 3pm-6pm. The sculptures, drawings, installations and video by this Paris-based wife and husband duo Lucy + Jorge Orta collectively explore major concerns that define the 21st century: biodiversity, environmental conditions, climate change and exchange among peoples. As heirs to the practice of social sculpture, formulated by Joseph Beuys in the 1960s, the Ortas’ works are relics of their own function—beguiling assemblages that are the platform for the preparation of food, mechanisms that actually purify water, and elements created for a 2007 expedition to Antarctica that are part of an effort to amend the 1948 Universal Declaration of Human Rights. The works in this exhibition are metaphors-in-action, constructions that perform the tasks of which they are emblematic. Working in partnership since 2005, Lucy + Jorge Orta create, produce, and assemble their artworks and large installations together with a team of artists, designers, architects, and craftspeople. They stage on-location workshops, ephemeral interventions, residencies, and master classes, which explore the crucial themes of the contemporary world: the community, autonomy, dwelling, migration, sustainable development, and recycling. Their work has been the focus of important survey exhibitions in major museums, including: the Barbican Art Gallery, London; Modern Art Museum, Paris; Museum of Contemporary Art, Sydney; Museum Boijmans Van Beuningen, Rotterdam; Hangar Bicocca, Milan; as well as the Venice, Havana, and Johannesburg Biennales.